I have a trip to New York City coming up soon and I’ve been going through some past images that I’ve taken in New York to get some ideas about what I might want to shoot on this trip. 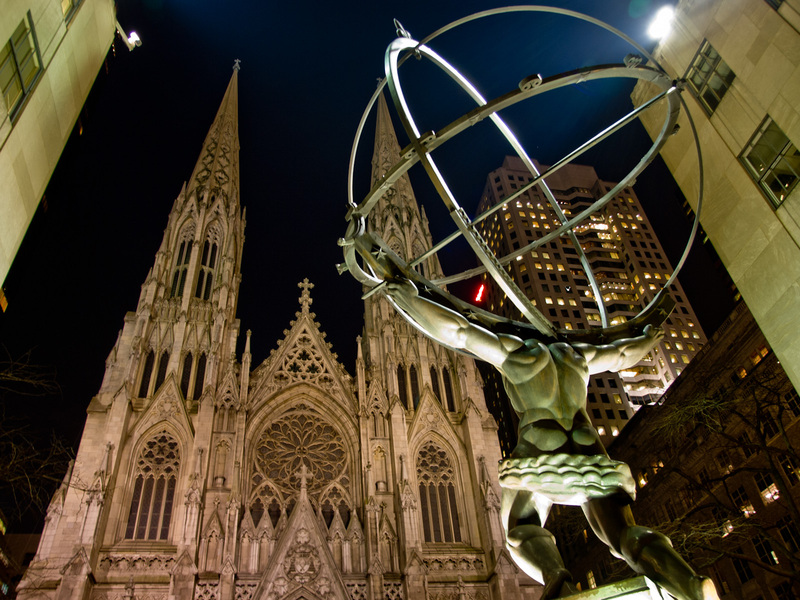 I came across this shot that I took of the Atlas statue located in Rockefeller Center, just across the street from St. Patrick’s Cathedral. I’ve worked on this image before but never really came up with something I really liked. I’ve tried various things to remove the extra buildings since I wanted the focus to be on Atlas and the cathedral across the street. I tried something new this morning. I used a couple filter in Color Efex Pro4 to bring out some detail in the shot and increase color saturation, and then I used a Film Noir preset in Silver Efex Pro 2 to convert the image to black and white. I made some additional adjustments and came up with the final image. I think it has a nice almost hand-drawn character to it. It’s not perfect, but I think it came out all right. Always interested in hearing your thoughts. Please leave them below. Copyright ©2008-2012 James W. Howe – All rights reserved. I think this new treatment has worked very well. Not only have you enhances the details in both the statue and the cathedral but you have suitably darkened the buildings on either side to lessen their impact. I absolutely love the look and feel of the high contrast version. It’s so refreshingly different, certainly compared with the two or three versions of my own shots of this scene I’ve tried to muck with in the past. Wow, really like this. Love the muscles on Atlas, like the only guy strong enough to hold up the world and also create the church. Only thing I would change is I would completely remove the building on the left. I had considered doing that. In a different version of this image I managed to remove the buildings on both the left and the right. For this one, I thought removing the building on the left would make things unbalanced, but the thought crossed my mind to do it and I might still try it out to see if I like it. Stunning in mono man. Very very nice! I like it! 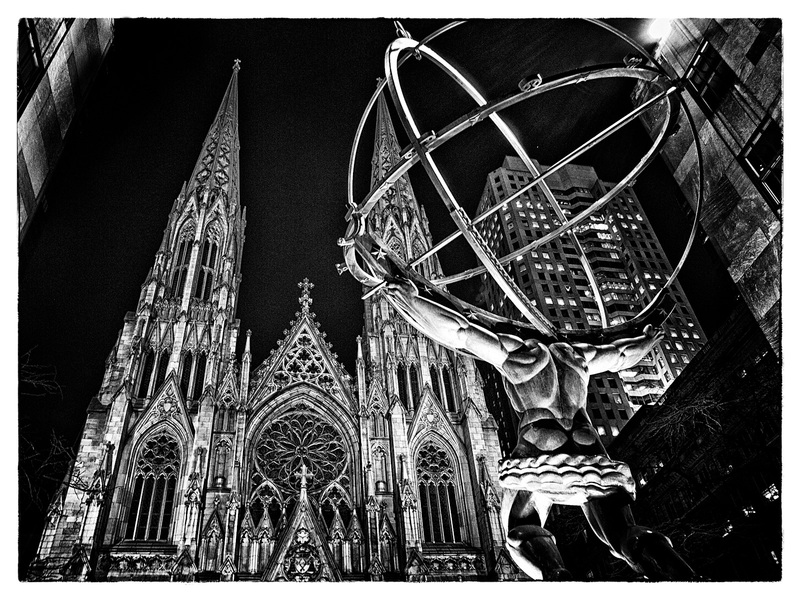 The point of view works well, and the gritty contrast is effective at highlighting the details.